By Caitriona McKenna | May 11, 2010. 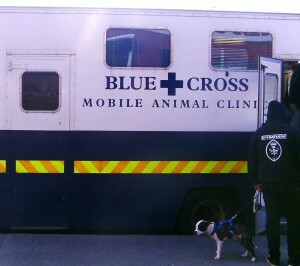 The Irish Blue Cross animal charity provides mobile clinic facilities that go to ten locations throughout Dublin every week supplying low cost veterinary care to pet owners on low income, including areas in and around the Liberties such as Crumlin, Smithfield and Walkinstown. The Liberty recently went out to one of the Blue Cross clinics to at their Walkinstown location to see what goes on. Volunteer Aoife Plunkett, who has been helping out at the mobile clinics for the last ten months, arrives shortly after 6.30pm to get things started, taking the names and details of the owners who had been waiting with their pets since 6pm or earlier. After giving a minimum donation of €15 for clinic services, the owners are then given a slip with their details and their pets’ details to hand to the veterinarian when they are seen to. Throughout the evening, Rogers treats and examines 31 animals, including making some referrals back to the Irish Blue Cross small-animal clinic in Inchicore. Her patients consist mainly of dogs and a few cats, and she works with the help of volunteer Kevin Owens, who has been with the charity for the past ten years. Owens was also the clinic driver for the evening but gave a hand with bringing the animals into the clinic from the waiting area and assisting Rogers during examinations and treatments. Treatments generally include vaccinations or worming as there are limited services available within the mobile clinics, but that in no way diminshes the quality of service the clinics provide and the friendly and comforting atmosphere created, not only by the vet, but also by the clinic assistants and volunteers. When asked exactly who can use their mobile clinic services, Christina explains that they are there for any pet owner who is genuinely needy. “We are there for the animals first and foremost, and if someone finds it necessary financially to come to us for assistance then we are happy to help them,” she says. The Blue Cross mobile clinics go to Crumlin on Tuesday nights, Smithfield on Wednesday nights and Walkinstown on Thursday nights as well as many other clinic locations throughout Dublin Monday to Friday, all between 7-8pm. For a full list of clinics and locations visit www.bluecross.ie/areas.html or contact the Irish Blue Cross at 416 3030 for more information on any of their services. would they let you in if you get there at 7:00pm? Yes, the mobile clinics are open from 7-8pm but it’s advised to get there as early as possible to be seen to sooner and ensure they have plenty of time to tend to everyone. People usually start to queue from between 6pm and 6.30pm, but you should still be seen to if you get there at 7pm, pending on how busy they are, but they always aim to squeeze everyone in if possible. hi i was wondering where are you located and when can i come in to get my cat neudited. and she might also need to be up to date with her shots. can you please get back to me about this matter. thank you. Give Blue Cross a ring on 416 3030 and they should be able to sort you out. Do you have to be getting scocial welfare to be able to use mobile blue cross ..